Counting Down To Bliss: Happy Easter! I hope you all have a wonderful holiday with your families! I just wanted to quickly share my Easter nails with you. These are not only my holiday nails, but are also the first result of a nail challenge! I've never done one before and have truly wanted to. For those of you who may not know what a nail challenge is, let me do my best to explain. Someone comes up with an overall topic for nail art and then breaks it down into a specific challenge for each day/week/month. Bloggers and non-bloggers alike are more than welcome to participate and it's just amazing to see the different works of art that each individual makes for that day's/week's/month's topic! The one I'm participating in was created by Hannah over at Polished Prisms. It's a spring themed challenge and it's AMAZING! She shared it in a group we're in on Facebook and the response to participate was a resounding YES! As you can see, it's a fun challenge, and extremely laid back! No need to do a new design every day if that's not what you want to do! If you would like to participate, be sure to head on over to the Facebook page here, and request to join. You can see what everyone else is up to and share what you've created! Alright, enough jabber, let's get to the nails! As you can see, challenge #1 is Spring Pastels. I thought I had more pastels, but in the end, I had enough to get the job done! I knew I wanted to do something girly and fun for Easter and pastels seemed like a great way to go, so I was able to knock out challenge #1 and an Easter manicure at the same time! I chose to do a skittle manicure (every nail a different color, but still in the same tone/color family) and I'm in love with my dotting tools so that had to happen. Then with my dotting tool, I just layered the colors. 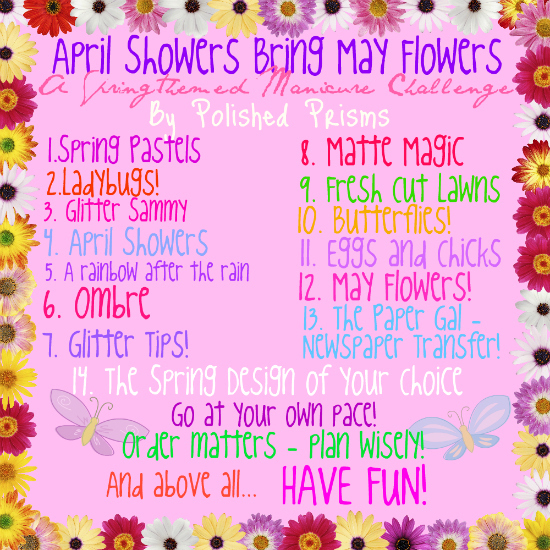 I have to say I'm pretty happy with my Easter/April Showers Bring May Flowers Challenge #1 designs! I hope you all have a wonderful day, and thanks for reading! Very cute!!! Love the color choices!!! Nice! I really like the colors! Thank you! I was worried I wouldn't have enough pastels to make a decent design. Boy was I relieved!